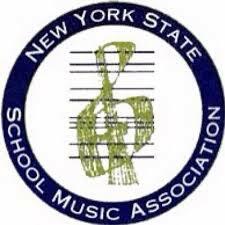 The New York State School Music Association is the NY affiliate of NAfME (National Assoc. for Music Education). It is a professional organization that evaluates student musicians in our state from elementary to high school. They host festivals at which students perform solo pieces and are evaluated by a judge; some festivals evaluate full ensembles as well. If selected, students will rehearse repertoire for the select ensembles and attend a 1-3 day festival culminating in a final concert. These ensembles are led by renowned conductors and educators from across NY and the country. Any Groton student who is enrolled in Band and/or Choir may participate! In some cases, there are limits to the number of students who may audition, in which case students will audition for us first. The most prepared and skilled students will then be able to audition for NYSSMA. The solo evaluations and auditions will help you grow as a musician. These performances will help you overcome performance anxiety while providing you with useful feedback. You can use this feedback to improve your musicianship. If selected for an honor ensemble, you will study under incredible educators and perform with passionate musicians such as yourself, inspiring you to continue making music. Auditions for honor ensembles occur each spring for the following school year (to participate as a senior, you audition as a junior). The only exception is All-County Choir, which only requires auditions for Ms. White. To sign up, you must indicate your interest to your teacher and sign a permission form. Senior High students should study their audition piece during their weekly lessons to prepare. Junior High students should meet with their teacher during a study hall or after school to select and prepare an audition piece. Auditions for All-County Choir will be Thursday, 9/28 after school. All other auditions occur in the spring: 3/24 (Cortland) and 5/4-5/5 (Ithaca). Depending on the number of students, we will either take a bus together or arrange carpools. When/where are concerts and conferences? See the list below- concerts occur throughout the school year. Anyone is welcome to attend, whether or not their student is performing! All-County performances are free, though all others are ticketed events.